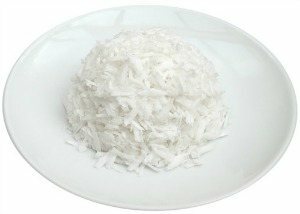 I have a confession to make, I’m addicted to coconut shreds. Those sweetened little flakes of goodness don’t last long in my kitchen. It seems every smoothie I make is a perfect candidate for their inclusion, and not just a tablespoon or two, but a good half cup. They add a little gritty, chewy, sweetness that I’ve come to love. Besides consuming copious amounts of coconut products, I also use coconut oil liberally on my skin, hair, and as an aftershave. Here’s a quick recipe for you. Combine 3 parts coconut oil with 1 part cacao butter using a double boiler with low heat. This makes for a great hair gel and aftershave. This concoction can also be used as a lotion, although it can be a bit oily, so you’ll want to rub off after 20 minutes or so. Experiencing a little sun burn? Apply this mixture, or another of my favorite superfoods, aloe vera. Fortunately, my local food co-op is usually stocked with organic coconut shreds and they’re rather inexpensive. I prefer the thin shreds over the thicker flakes. Now get your coconut on and enjoy this smoothie! Please leave a comment below if you try this delicious coconut ginger smoothie. Happy Blending! Will 1/2 or 1 tablespoon coconut oil be a suitable substitute for the 1/2 avocado? 1/2 tablespoon coconut oil will supply ample healthy fat in place of avocado. The smoothie won’t be very thick without avocado though. May want to add banana to thicken.